The Clark Family is coming together to perform right here in Rocky Mount, returning to their roots, and the place they call home. The brothers and sisters each found a niche by learning young how to play instruments and singing for many years at churches and bluegrass festivals. In the nineties the family stumbled upon the Galax Fiddler’s Convention and won in 1993. The older siblings then made their way to Nashville in 1998 where they were signed on as the country music group “The Clark Family Experience”, with their debut album which was produced by Tim McGraw. They were widely known for their song “Meanwhile back at the Ranch”. In 2001, they were nominated for an ACM award for Best New Group. In 2007, three of the older siblings went on to perform and win The Next Great American Band on Fox. Members of the Clark Family have performed with Carrie Underwood, Blake Shelton and Tim McGraw. 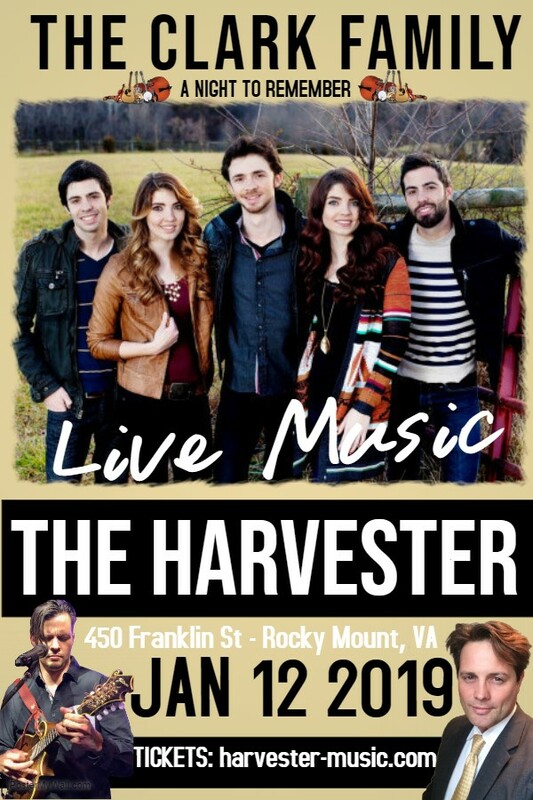 Now in a rare performance the Clark Family is coming together in their hometown to play at The Harvester in a concert you don’t want to miss!